This combination photo made available by the London Metropolitan Police Sept. 5, 2018, shows Alexander Petrov, left, and Ruslan Boshirov. 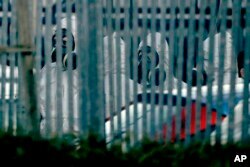 The two Russian hitmen who British authorities accuse of attempting to murder former Russian spy Sergei Skripal and his daughter Yulia made several European trips — including half-a-dozen to Geneva — in the months leading up to the Salisbury nerve agent attack. Western intelligence agencies are probing the movements of Ruslan Boshirov and Alexander Petrov trying to establish what they may have been doing during frequent trips across Europe from September 2016 — when their passports were issued— until March this year. 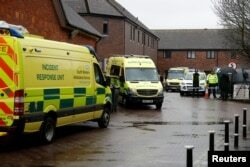 FILE - Emergency services vehicles are parked behind a pub that was visited by former Russian intelligence officer Sergei Skripal and his daughter Yulia before they were found poisoned, in Salisbury, Britain, March 28, 2018. The British prime minister’s comments came as a vitriolic war of words between Britain and Russia escalated following the accusation by British police and prosecutors of GRU involvement in the poisoning carried out on British soil. Kremlin officials vehemently deny Russia’s involvement in the attempted assassination. Britain’s security minister, Ben Wallace, says Russian President Vladimir Putin bears ultimate responsibility for the Salisbury poisoning because “it is his government that controls, funds and directs” the GRU. “I don't think that anyone can ever say that Mr Putin isn't in control of his state…The GRU is, without doubt, not rogue, it is led, linked to both the senior members of the Russian general staff and the defense minister and, through that, into the Kremlin and the president's office,” he told BBC radio. On Friday, Russian foreign ministry spokeswoman Maria Zakharova denied the British accusations, saying, “frankly, they are lies.” The Kremlin has said it has no idea about the men the British have identified as prime suspects in the nerve agent attack. Both men have been charged in absentia and Britain has issued Europe-wide arrest warrants for them after police combed more than 11,000 hours of CCTV surveillance footage to identify the men and to track their movements from when they arrived on an Aeroflot flight from Moscow at London’s Gatwick airport on March 2 to their departure from Heathrow on March 4. ​The suspects stayed at a budget hotel in east London — allegedly police found traces of novichok in their room — and went to Salisbury on March 3 and 4. The first visit was likely for reconnaissance, say British police and prosecutors. But mystery still surrounds the identities of the two would-be assassins. British authorities have said both men were using pseudonyms but that they know their real names. It is unclear why the British have refrained from publishing the real names. Some Russian journalists, though, believe Boshirov and Petrov are indeed their real names and not assumed identities. Ruslan Boshirov has a profile on a Russian social media site, My World, that was posted in July 2013. The details in the profile, including the date and place of birth, match those on the Russian passport. The email address that Boshirov used for the My World account was also used for a Facebook account that listed Boshirov as working for a Moscow pharmaceutical-purchasing company called Headway. Russian crime journalist Sergey Kanev argues the documents Boshirov and Petrov used to fly to London in March belong to real people. He analyzed information held in Russian state databases and found Petrov registered as the owner of a Chevrolet Tahoe in 2001. In another database he discovered Boshirov was fined for a driving offense in 2015. Other Russian media outlets, though, argue the names are real enough but were grabbed by the GRU for operational purposes many years ago. The two men’s passports were issued in 2016, just weeks apart. The frequent trips the pair took across Europe — to the northern Italian town of Bergamo, Paris, Amsterdam and Geneva — are also being focused on. The trips are sparking a mixture of bemusement and surprise. One of their Geneva visits coincided with Syria peace talks being held in the city last November and December. Travel manifests obtained first by British newspaper the Daily Telegraph and Russia’s Fontanka newspaper show the men booked about 30 flights in and out of the Russian capital between September 2016 to last March. They flew mainly with Aeroflot but also took flights with Air France and KLM Royal Dutch Airlines as well as a Russian low-cost carrier to fly to Bergamo. One theory behind the frequent travel is that the men — or their superiors — felt they needed to build up their travel to establish their ‘false identities’ as wealthy international businessmen. On their British visa applications the men said they were businessmen, according to British officials. But other intelligence experts are surprised the pair were traveling overseas so much in the run-up to the assassination attempt, arguing it was hardly discrete and risked drawing attention to themselves and imperiling an attack that was clearly planned months ahead. Britain and nearly 30 other countries expelled more than a hundred Russian diplomats earlier this year in retaliation for the nerve agent attack. British allies the United States, Germany, France and Canada issued a joint statement with Britain’s Theresa May Friday agreeing with London’s assessment that the operation was “almost certainly approved at a senior government level” in Moscow.